1. The only way to tell a female dolphin from a male dolphin is that the female and male dolphins both have a slit on their underbelly which is their "family parts", except they look identical on both. However, on the female, there is a smaller slit on either side of this genitalia slit. This is where the female dolphins breast feed their young! 2. Did you know that dolphins are mammals? They have mammary glands. 3. 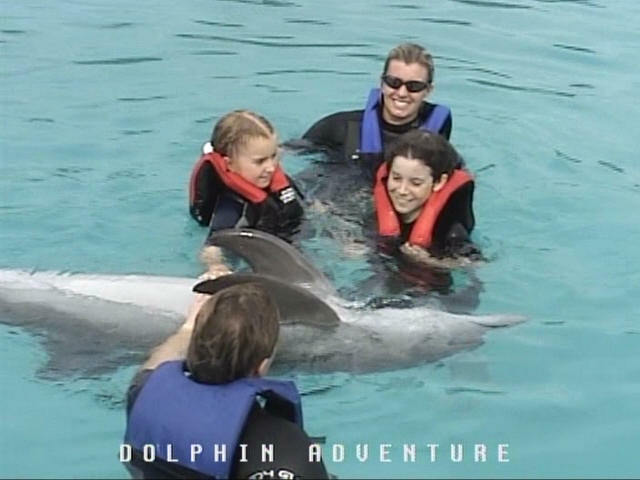 Did you know that dolphins carry their young for 11 to 12 months and give birth while swimming? 4. Did you know that dolphins have an echo-locating system so that in the dark of the depths of water they can make out a 3 dimensional object by changing their signals that bounce off of things? It was described sort of like CAT scans, or MRIs, whichever one uses the signals to make a picture of your insides, where different signals transfer through different densities of the body and therefore show the difference between bone, soft tissue, tumors, veins, etc. Dolphins do that same thing with their echo-locators, or signals, that they emit from their "blow hole". It sounds like a whimper or a click, whichever they want to use. 5. Did you know that dolphins have no pores on their skin? This means they shed their skin every day, all the time, to renew it. I think they said they shed their skins every day, or something more than that! 6. Did you know that the blow hole where the dolphin "breathes" through the top of the head is not connected to the alimentary canal in any way? Therefore there can be no sound out of the mouth as it has no method for transmitting sounds as no air ever goes through it! They are completely separate. 7. Did you know that dolphins feel like a wet hot dog? 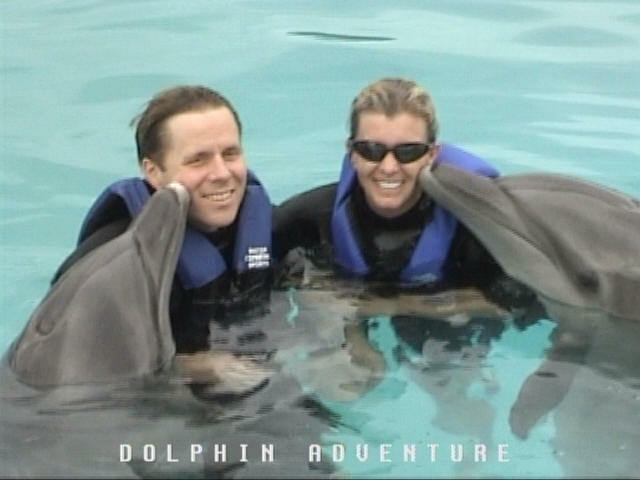 Ask my mom and dad, who got to hear a 4 year-old at Sea World in San Diego tell us that in December 2003! Very funny. But, now I know it is true! 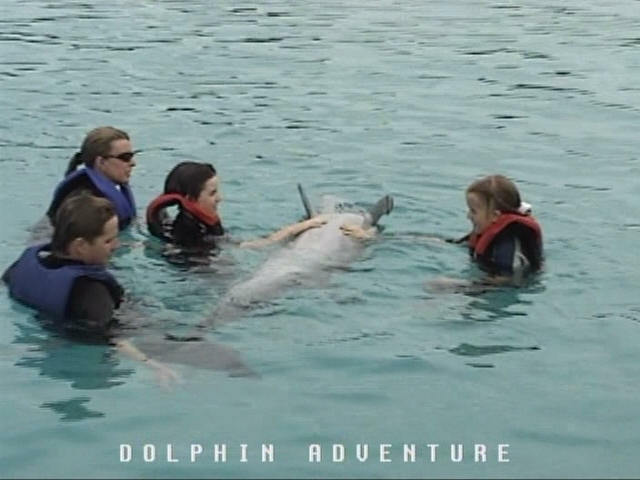 The dolphins would nudge us and turn over and they apparently like their bellies rubbed. Meagan thought it was a bit hard to do but then she giggled through the entire event. We have a produced video of this event, by which I have snatched these photos! They had each of us, in pairs, wade to the middle of the pool. Then, they told us to lock hands. Then they signaled to these gentle giants to kiss us! The kisses lasted about 30 seconds. 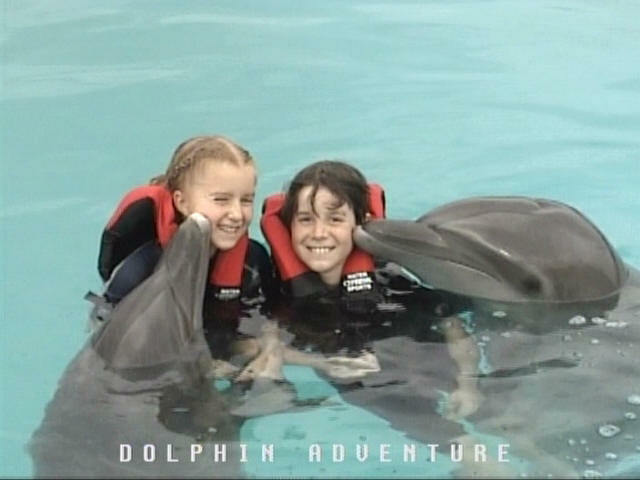 Then they told us to gently push them away, then they signaled to have the dolphins move away. 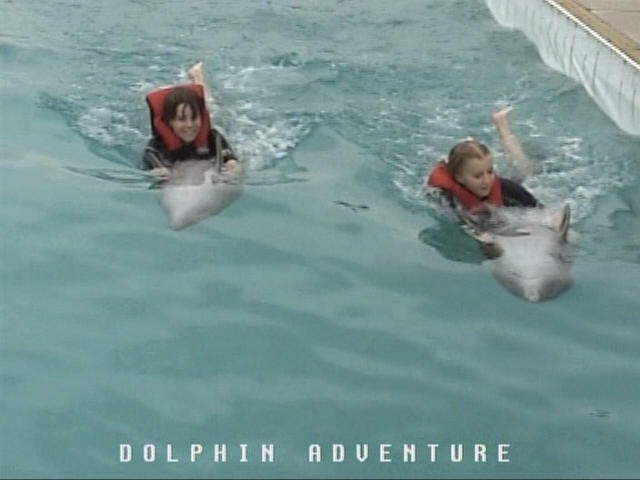 After 45 minutes interacting with these bottle-nosed dolphins, in pairs, we were instructed to grab the dolphin fins as close to the body of the dolphin, relax and hang on. 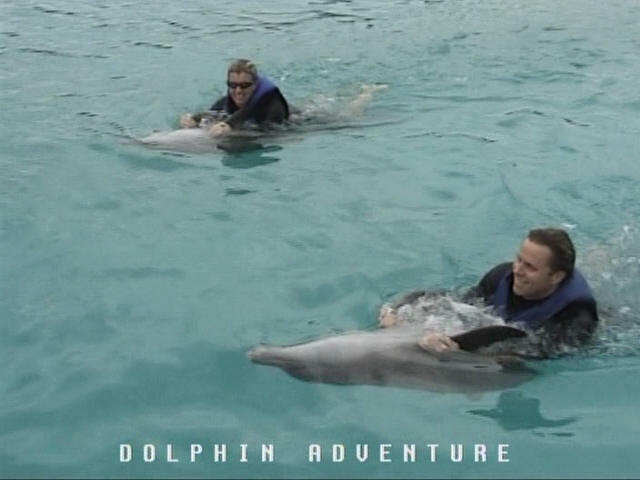 We were then given a very fast ride, belly to belly, on the dolphins, for about 125 feet! This is our kiss. Very wet! Kelvin and Meagan couldn't stop talking about this experience. 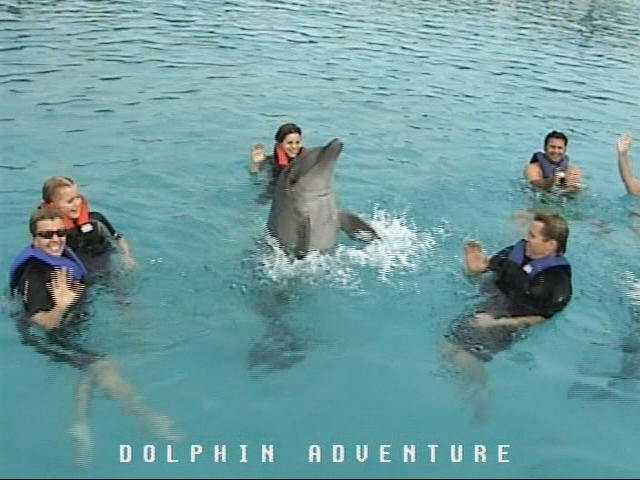 It is at Nuevo Vallarta marina, which has this Dolphin Adventure which you have to make reservations for. It is about 10 minutes from our marina. At the end, they had us all go back to the edge of the pool and put our hands over our heads and our feet underneath us. 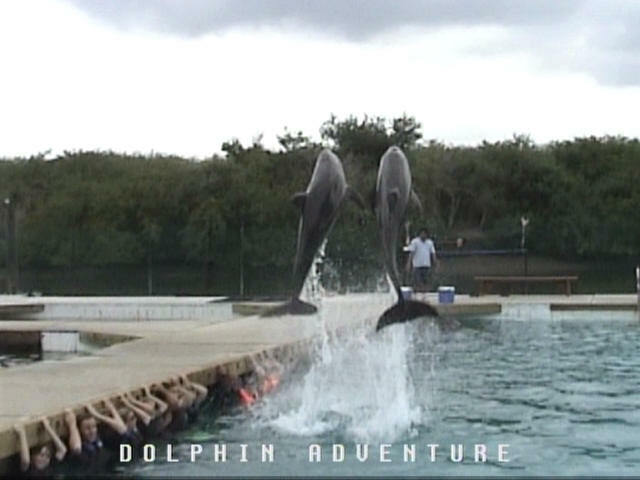 Then the dolphins went and did this in front of us! It was spectacular! Where in the world are Kelvin and Meagan?